POLITICAL TIDBITS: As we mark Dr. Rizal’s 153rd birth anniversary, there’s a lot of despair and sense of hopelessness among the people he dearly loved, over our shattered institutions. Even Cardinal Tagle, normally a man with measured speech especially about politics, says “You do not know whom to trust anymore” as he calls for governance to restore people’s trust in our institutions. As we mark Dr. Rizal’s 153rd birth anniversary, there’s a lot of despair and sense of hopelessness among the people he dearly loved, over our shattered institutions. Even Cardinal Tagle, normally a man with measured speech especially about politics, says “You do not know whom to trust anymore” as he calls for governance to restore people’s trust in our institutions. Today marks the 153rd birth anniversary of our National Hero, Dr. Jose Rizal, but unfortunately the nation is in shambles these days, and there’s a lot of despair and bewilderment among the people that Rizal so loved as to give up his life for their freedom and well-being at the Luneta one day in December 1896. Senate President Franklin Drilon was quoted recently as asking the Filipino people to “keep faith in the country’s democratic institutions despite the pork barrel scandal.” But that may be Mission Impossible at the moment, for at the bottom of the sense of hopelessness of many Filipinos today is the realization that those very democratic institutions have been severely damaged because of shameless and unconscionable politics and politicking. How do we go about rebuilding them? Cardinal Tagle speaks for most Filipinos and if Dr. Rizal were alive today he would be the first to lament the destruction of our democratic institutions. One institution where the people’s trust ought to be invested in---the repository of just laws and decrees and the final arbiter of what’s lawful and right---is the Supreme Court. But two very significant events are being keenly watched under its aegis, which challenge its integrity and threaten its stability. Apparently this retrospective pardon is contemplated in the case of DAP dole-outs to senators particularly during the Senate trial of Chief Justice Renato Corona, as this could result in possible impeachment of P-Noy or a plunder case against him once he leaves office in 2016. A hair-splitting decision by the SC would be read as a future way out for P-Noy and his legal advisers. As various lawyers’ and legal organizations have already pointed out, the juggling of public funds even toward another public use is a criminal act, a violation of Art. 220 of the Revised Penal Code. Thus, it’s possible that due to enormous public pressure, the SC would rule DAP as unconstitutional WITHOUT ANY QUALIFIER. But the bigger wonder is how there could even be momentary contemplation of a retroactive decision by the highest court. In other words, how could select justices think they could get away with a twisted idea!. The other issue being watched in the SC concerns its traditional role of endorsing one of the top nominees by the Judicial and Bar Council (JBC) for appointment to the Court in a vacancy. This practice of the high magistrates of screening nominees to the Court from the short-list submitted by the JBC---the vetting body for all appointments to the bench, established by the 1987 Constitution and chaired by the Chief Justice---and voting on an acceptable recommendee dates from the late Chief Justice Andres Narvasa’s time. There's a vacancy in the SC with the retirement last month of Justice Roberto Abad, hence the JBC went into the process of drawing up a list of nominees, for passing on to the SC, and subsequently the SC’s recommendation is submitted to the President. But as narrated in a banner story yesterday of Manila Times’ senior reporter Jomar Canlas, Chief Justice Ma. Lourdes Sereno wrote her colleagues last May 29 that she had decided to “favorably consider” the request of “several justices” to DO AWAY with this tradition of making a recommendation. The implication is that without the input of the high magistrates, the President can go ahead. It has been leaked before that COA Chair Grace Pulido-Tan, a protégé of Finance Secretary Cesar Purisima and who resigned with the Hyatt 10 group from the Arroyo administration in July 2005, has asked to be appointed to the SC. In view of her unbridled loyalty to Malacanang (most notably the canalizing of the COA report on PDAF scams to 2007-2009 only, resulting in what’s denounced all around as “selective justice” in withholding any report on wrong doings in the four years under P-Noy) Pulido-Tan is likely to bag that SC job. According to the Times story, Sereno’s move is seen as manipulating the JBC’s short-list because she is supportive of Pulido Tan’s joining the SC. The problem, however, is in the SC. Informed of CJ Sereno’s decision to cut off her colleagues from their vetting/recommendatory role, as narrated by Times reporter Canlas, some audacious magistrates bridled. In the recent regular en banc decision, Associate Justice Teresita Leonardo-De Castro, who had crossed swords a number of times with Sereno, assailed the latter’s decision to strip them of this right to vote and choose whom to recommend to the President. According to Canlas, De Castro pointedly asked Sereno to identify the justices who made the request to skip this process “but she couldn’t name one.” Several other justices also manifested their desire to exercise their screening/voting right, but this was ignored. But obviously Sereno disregarded this stipulation, and her action is now being viewed as arrogance of power---thus further dividing the highest court. 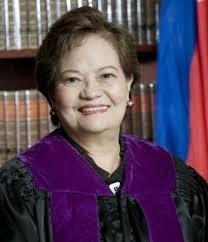 Another institution rocked late last year by a noisy dispute was the Sandiganbayan, after the most junior justice, Amparo Cabotage-Tang, was appointed by P-Noy as Presiding Justice in one of the deepest selection process in memory last Oct.1, 2013. Justice Tang was No. 15 before the retirement of Presiding Justice Francisco Villaluz, but she was plucked ahead of all the others to preside over the graft court. That brought grave demoralization in that court. After her appointment she should have assumed the chairmanship of one of the Sandiganbayan’s five divisions, but all the senior members refused to give up their chairmanships---with reason. Under the Revised Internal Rules of the Sandiganbayan, the most senior justice takes precedence over the other justices, following the date of their appointments. When Justice Tang was appointed to the helm of the graft court, its personnel played up “No Vacancy” in the chairmanships and this was widely disseminated in media. 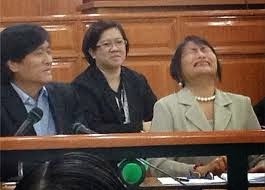 After the retirement of one justice earlier this year, Tang finally got to chair the Third Division, and last Friday, a raffle of the plunder cases against the three senators resulted in the 17 or so cases against Sen. Juan Ponce Enrile falling on Tang’s lap in the Third Division. Considering that the PDAF scams first burst into the news in early August 2013, triggering the “Million March” of Aug. 26, 2013, and the admission by the Palace that that President Aquino and his allies already had the list of PDAF cases against the three opposition senators and Napoles' shenanigans, the question now being asked in some quarters is, did a “friendly” presiding justice have to be plucked from the bottom of the heap? At this point, as we recall the 153rd birth anniversary of our National Hero, one is left to ponder how our institutions are being wrecked in this administration. It's tempting to look not just at CJ Sereno but also at the other officials in our government who are protected by the Constitution with fixed tenures and salaries, so that they could be INDEPENDENT of the appointing power---and not subservient. Consider the actuations of COA Chief Pulido Tan who, with Justice Secretary Leila de Lima (because De Lima is a Cabinet appointee she has no protection under the Constitution---so that not much independence is expected of her) has resorted to what is roundly denounced even by “yellow” journalists as selective justice in the prosecution of opposition senators---while refusing to release the records of all errant allied legislators, Palace officials and NGOs in the four years of P-Noy. Now it’s obvious why---she wants to be in the SC. On the other hand, look at Ombudsman Conchita Carpio Morales whose independence is equally protected by the Constitution, but how she fudged the figures of CJ Corona’s foreign account during the Senate trial---obviously to please Malacanang. She does not seem too in a hurry to prosecute errant people in the current administration which has heaped such praise for her in public. Doubtless Morales will star again in P-Noy’s coming SONA. Thanks for making such a cool project. I've been checking the site for the Windows version, but I never left a comment about it. I know you are working hard and doing it for all-best-essays.com free so you shouldn't feel rushed or anything. I hope you can continue this type of hard work to this site in future also. Because this blog is really very informative and it helps me lot.